This was my first time reading anything by Heinlein. I really enjoyed the first half, and I was pleasantly surprised by how readable and entertaining it was, but I disliked the second half quite a bit. The main premise is that there is life on Mars, and humanity has only just begun to travel there. As a result of the first trip, a baby is born on Mars, his parents die, and he is raised by Martians. When the book begins, Mike, the baby in question, is now an adult and he has just traveled back to Earth to meet his race. I thought the first part was great. 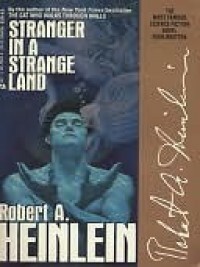 It was a bit dated in some of its attitudes and beliefs, but the story was interesting and I really liked how Heinlein built up this alien culture which looks at things so differently from humans, to the point that some things simply can’t be translated in terms humans can understand and vice versa. The characters were relatively interesting and likeable. Even Jubal was likeable at first. I had the impression, without knowing anything about Heinlein’s personality or beliefs, that Jubal was Heinlein’s voice in this book, representing the ideal older man and expressing the ideas that Heinlein wanted to convey to his readers. The second half devolved into mysticism, orgies, and, worst of all, monologues, and I didn’t care for the ending. But my biggest complaint was with the monologues. They weren’t terribly long, but they were frequent. The author, usually through Jubal, seemed to have a lot of opinions on religion, philosophy, families, and cultural taboos that he wanted to express. My problem really wasn’t with the opinions themselves. I agreed with some and disagreed with others. I was horrified by a few and amused by others. It’s just that they were presented in a manner that felt too preachy, and that pulled me out of the story. And at that point, the story itself became less interesting and everything felt like a vehicle to deliver the monologues. I have a couple of Heinlein’s other books on my reading list, and I’ve seen them compared more favorably to this one, so I intend to cycle back around and give him another try eventually. When he was just telling me a story and not trying to preach at me, I enjoyed his writing style. On the sites where I can give half stars, I’m rating this as 2.5. 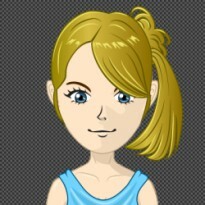 On Goodreads, I decided to round up to 3 based on the first half and parts of the second half. In the Night Garden, the first book of The Orphan’s Tales by Catherynne Valente, another new-to-me author.